I’ve never been a big fan of Valentine’s Day as an adult. Sure, during my early twenties, before I came to believe that February 14th was no more than a day to get all “show offy” with romantic gestures because we had all been so crappy toward each other the rest of the year, I stressed over planning the perfect expression of my undying love, which usually manifested itself in the form of an overpriced dinner at a restaurant that made both me and my date completely uncomfortable paired with the obligatory flowers and chocolate. When I see those boxes of tooth shattering candy hearts with their sappy beseechings and earnest promises begin to takeover shelves and endcaps of every grocery store, I’m not overcome with a longing to wine and dine anyone; no offense to my partner. This year I discovered why I am so strongly indifferent to the holiday as it’s celebrated today and why I want something different. The first thing that invaded my thoughts as I woke this morning was a note that was included in the Valentine care package my mom sent me when I was 24. Even though I didn’t know it at the time, it would be the last I would receive from her; less than a year later she would be rendered incapable of putting together care packages or writing notes. Somehow, despite the fact that I’m a fervently adept minimalist, this note managed to survive that time when I was unaware how important it would become and has made every move with me for the last 22 years. 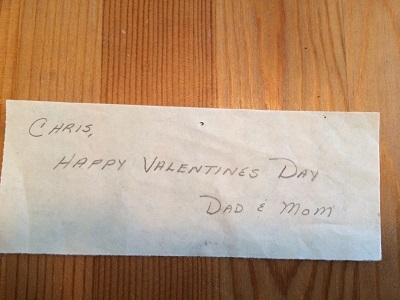 This note got me thinking about the Valentine’s Days of my childhood. It made me think about the year that Dad bought a single red rose for all three of his girls. It made me think about how Mom required that I bring a card for every student in my class, even those I didn’t like. “Yours may be the only card someone receives. Think about that.” she would tell me, needing no further explanation to make her point. It made me think about all of the special dinners Mom planned for us to share as a family. I’m sure there were times when Mom and Dad celebrated as a couple, but it always seemed more important to them that the holiday have a wider reach. It was a day to share with all your loved ones, not just your romantic partner. So, when Dad called to ask if he could take us all to brunch I guess it wasn’t surprising. It made perfect sense for my sister and I, our partners, Dad and his girlfriend, and our aunt to all share a meal today. As we reminisced over old photographs of those family members who are no longer with us and laughed as long forgotten stories were remembered, I could feel Mom there too, urging us to make this our new Valentine’s Day tradition. I’m pretty sure she also told me to get a frame for that note if I intend to keep it from getting ruined. Thanks for sharing the bigger picture… Always enjoy your writing. Your mother and father gave you wonderful Valentine memories. Yes, frame that! Happy Valentine’s Day. Thank you : ). Yes, I will find a frame today! Your mom reminded me of a simplier time when family & home mattered most. When I barely get my xmas tree up in time, I remember how every holiday got its fair share of presence in your parents house! I loved walking in and seeing all her cut out handmade decorations! Chainlink hearts hung by the fireplace! Cupids and hearts on the walls and mirrors! She never missed an opportunity to celebrate life! I think this is a perfect way to celebrate this pretend holiday! It actually has significance rather than being a response to marketing. So, yay! I wish I had known your mom, Chris, and I wish you had known mine. I agree! I wish I could have known your mom. I met her just once briefly, but that photo you have on your wall let’s me know she was a force!